Ages and ages ago – about two weeks since next Thursday – a giant green dragon stole my baby brother, Godfrey. Well, okay, the giant green dragon actually stole the house. … I saw it all happen. The only clues are potato chips and sarsaparilla drink. Can Georgia solve the mystery of the missing family home? 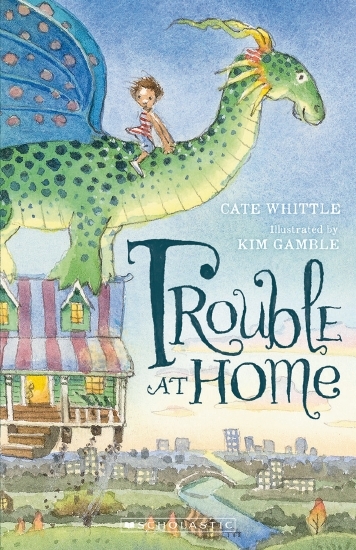 A family story with an unexpected twist, perfect for developing reader confidence. Lindfield, NSW. Manly, and Barraba, north-west NSW. Beaumont Road Public School, Killara; Chatswood High. Happy at school, especially English and Art. Robinson Crusoe and Moominsummer Madness. Tove Jansson and Roald Dahl. Fruit; blue; Journey to the Centre of the Earth. Stephen Axelsen gave me a (NSW Department of Education) School Magazine story to illustrate. To support my family doing something I loved. I try to read carefully. Have you had any funny or embarrassing moments as an illustrator? For the spray from Old Bunyip's mouth I used my daughter's toothbrush — she never knew. Read; make things, walk and swim. I enjoy gardens, firesides, watching birds, fish, puppies, painting, playing and being with friends.